Returns the average of a range of values that match a certain condition. 'rgeCriteria - The range of cells containing the criteria you want to check. 'sCriteria - The criteria value you want to match. 'rgeAverageRange - The range of corresponding values you want to average. AVERAGEIF was added as a built-in function in 2007. AVERAGEIFS was added as a built-in function in 2007. There is an Array Formula equivalent if you do not want to use the user defined function (see below). This user defined function is similar to the built-in SUMIF function. To find out more about Array Formulas please refer to the Array Formulas section. To find out more about the individual functions please refer to the AVERAGE function and IF function pages. This example illustrates how to use an array formula to obtain the average value in a column based on a condition. The formula in row 16 returns the average in the "Sales" department. The formula in row 17 returns the average in the "IT" department. 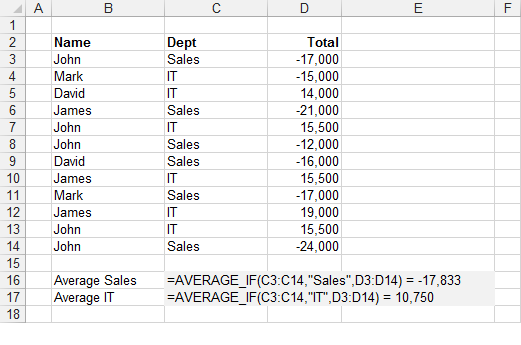 The formula [C3:C14="Sales"] returns an array of 1's and 0's indicating if the value in column "C" satisfies the condition. Every number 1 in this array represents the value True in the IF statement and therefore has its corresponding value returned from column "D". Every number 0 in this array represents the value False in the IF statement and therefore an empty string is returned in this case. The MAX function will ignore any string values. The use of the empty string is to ensure that the formula works with both positive and negative numbers. This array of numbers is then passed to the AVERAGE function to obtain the largest number. Remember that you must press (Ctrl + Shift + Enter) to enter the formulas. You cannot use column references (such as "A:A" or "D:D") in your array formulas. Any cell ranges passed to an array formula must have the same number of rows. This is to ensure that all the temporary arrays used are the same length.